By Louis Jacobson, Manuela Tobias on Friday, August 31st, 2018 at 12:03 p.m.
At his rally in Evansville, Ind., President Donald Trump presented a familiar array of claims, some more accurate than others. 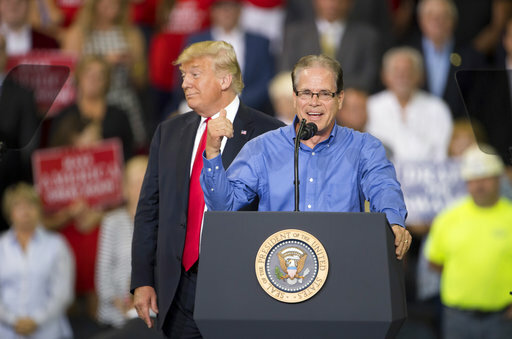 Trump’s speech on behalf of Mike Braun, a Republican state senator and businessman running for U.S. Senate, included steel plant expansions that aren’t happening, historic polling that doesn’t exist and unemployment declines that are almost true. He attacked incumbent Democratic Sen. Joe Donnelly as an ineffective legislator who voted against Trump’s agenda on health care and taxes. Here is a rundown of some of Trump’s statements from the rally. "People that have really helped me in Washington. You know, we did a lot of things, including cutting your taxes, the biggest tax decrease ever." False. In inflation-adjusted dollars, the recent tax bill is the fourth-largest since 1940. And as a percentage of GDP, it ranks seventh. "And I tell the people, the typical American family of four earning $75,000 will take home $2,000 at least extra this year, and many will take home really much more than that. A lot." Half True. That’s the case in the first year only; after that, the benefit starts to shrink and eventually turns into a tax hike. "And something I am very proud of, African-American unemployment recently achieved the lowest rate ever recorded in the history of our country. Hispanic Americans and Asian-Americans, the unemployment have recently reached their lowest rates in the history of our country." Mostly True. Unemployment rates for all three groups did hit lows under Trump. They’re not necessarily at their lowest ever now, however. "We've created nearly 4 million new jobs since the election and lifted almost 4 million Americans off of food stamps." As this fact-check shows, there was no sudden turnaround after Trump took office. The decline began years before. When Trump took office in January 2017, there were 42.7 million Americans on food stamps. By May 2018, there were 39.3 million Americans collecting food stamps. That’s a decrease of 3.4 million. Since November 2016, when Trump was elected, the economy has added about 3.9 million jobs. That period includes some of the time Obama was still in office. "And U.S. Steel is opening up at least seven plants, and they're going to be spending billions of dollars building new stuff. I'll tell you what, steel. We were dead. It was over. Now we're going to be using our mines, we're going to be using -- we're opening up -- we're like -- it's the hottest thing that's happening." False. Between restarts, new mills and expansions, the steel industry has seen significant investment this year. But U.S. Steel isn’t opening any new plants; it’s restarting two shuttered mills. "They put tariffs on our dairy products going into Canada almost 300 percent." Mostly True. Canada’s dairy tariffs are high by any standard. But the United States has recently run a sizable trade surplus with Canada in dairy products, driven by a strong business in a milk product that was unaffected by the high tariffs. Trump also glossed over the fact that the United States imposes its own trade barriers on certain American-made products. "I guess it's a poll of some kind. Joe Donnelly rated least effective Democrat in Senate in a new study." Needs context. Donnelly has never sponsored a bill that became a law during his first term in the Senate. That doesn’t mean none of his legislative proposals in the Senate have become law. Donnelly co-sponsored bills, wrote amendments and crafted language that made its way into 43 laws during his single Senate term. "At the center of this election is the issue of border security, so important. We've now started the wall in San Diego, and we're doing another 90." Mostly False. The "wall" Trump has gotten isn’t the solid, 30-foot-high concrete wall he promised during his run for president. Instead, the projects underway include arrays of steel posts, between 18 and 30 feet high, that allow border patrol agents to see through. The planning for at least some of these projects, which will replace shorter scrap metal fencing, started long before Trump ran for office. "In 2006, almost all (Democrats) voted in favor of, essentially, a wall, OK? Now they think it's politically expedient to anything Trump wants, please go against. Please." Half True. They did vote for the Secure Fence Act of 2006, which authorized building a fence along about 700 miles of the border between the United States and Mexico. Still, the fence they voted for is not as substantial as the wall Trump is proposing. Trump himself called the 2006 fence a "nothing wall." "I actually asked them, I said, did they do polling when Honest Abe Lincoln was around? You know what? Nobody's been able to give me that answer, but I'm assuming they did, OK? So we can say we're beating Honest Abe." No, they didn’t. No pre-1936 president served in an era with scientific polling, so Trump’s comparison of himself to Lincoln is spurious; we have rated it False. Among Republicans at this point in their presidency, Trump is smack in the middle of post-war presidents in approval rating. Both President Bushes and Dwight Eisenhower had approval ratings among Republicans that were higher than Trump’s current level of 85 percent, while Presidents Nixon, Reagan and Ford had ratings that were lower. "Look at social media. It's a thing called free speech rights. You look at Google, Facebook, Twitter, and other social media giants. And I've made it clear that we, as a country, cannot tolerate political censorship, blacklisting, and rigged search results. And you know, it can go the other way, also." Trump has been taking to social media to bash social media a lot recently. Here’s some context on Twitter shadow banning, rigged Google search results and Alex Jones. "There is an interesting convergence between left and right political wings to begin to redefine these platforms as public utilities or public forums that cannot exclude speakers at their own whim," said Yochai Benkler, co-director of the Berkman Klein Center for Internet and Society at Harvard Law School. "That is not, however, the present state of federal law."